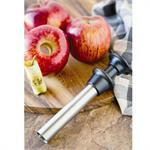 Easily remove the core from your apples with this stainless-steel apple corer. Center the tube over core and push firmly into the apple. Use black plunger to release core from bottom of tube. This sturdy, rust-free, tool grade aluminum machine, will give you years of service. 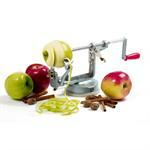 You will get through a box of apples in no time. The stay sharp stainless-steel blade is adjustable to provide the right tension to peel off thin strips of skin. 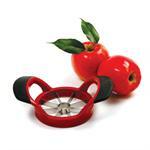 With 16 smaller wedges this cutter gives you perfect sized apple/pear slices for pies, desserts, and canning. Cut onions that are ready to use on your burgers or in a soup or stew. Just center fruit on the push plate, line up the arrows and push down. 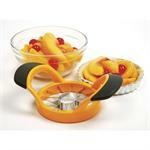 Peach corer/wedger releases pit for disposal and slices peaches into twelve even sections all in one easy motion. Use marks on wedger as guidelines, matching up to seam of fruit. Have you ever put a perfect pie in the freezer, only to have someone set something heavy on it - "scrunch" - not with this covered pie pan. This aluminum bakeware with its sturdy clear lid keeps baked goods fresh and safe. Roll out pastry, place in crimper, add filling, fold and seal thats all there is to it. 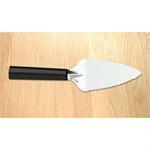 These pocket pie crimpers make 6" sweet or savory pies perfect for packed lunches or picnics. Roll perfectly round crusts for pizza, pies, pastry, and even cookies. Simply unzip the bag, add a bit of flour and your ball of dough and zip the bag closed. The large, easy to read markings on the bag make it easy to roll your pastry the perfect size. Pastry professionals know the benefits of having a good Pastry Brush, not just any pastry brush. The bristles of these pastry brushes are constructed with boar's hair which is the best for evenly brushing butter or egg wash over your baking and pastry. The unique diamond shaped blades cut through hard butter and shortening without the need to pre-cube your butter. Clump-free results when making dough for pastry, biscuits, streusel and more. A fool proof way to make mess free crusts. Place your dough in the floured pouch, zip up and roll out as you normally would. Easily roll to the desired circle size up to 14". Unzip and slide dough into or onto your pan or pie. The cool stone will keep your pastry flaky and the weight of the marble will do the work for you while rolling out your pastry. Unlike wood, marble is non-porous, resistant to grease, and is much easier to clean. The variations in colour make them unique. 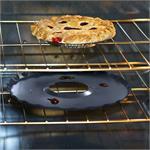 Place the silicone pie protector over the pie before baking to keep edges of crust from burning or overbrowning. 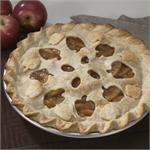 Use on fresh or frozen pies that are approximately 9" in diameter. Made of silicone and is heat safe up to o 500ºF (260ºC). Gently shake a light dusting of flour, icing sugar, cocoa powder and more. The simple design has a squeeze handle that stays open when you squeeze it, and snaps shut when you release it. Double sided, with a solid, flat bottom, it can rest on the counter. Cuisipro's commercial quality pastry blender has thick blades which provide stability when blending. The 6 stainless-steel blades are extended for increased cutting efficiency and a secure grip handle allows for precision handling. 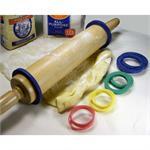 These stretchy bands fit on most standard rolling pins and are colour coded for your convenience. Set of 4 - blue 3/8" (9.5mm), green 1/4" (6.35mm), yellow 1/8" (3.2mm), and red 1/16" (1.6mm) so you can roll your dough to the exact thickness you need. 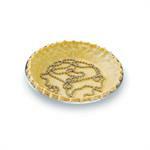 Double sided pie crust cutters make a professional cut work design on your pie tops. 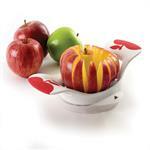 Reversible, 2-in-1 design make beautiful apples or leafy decorated pie crust. Frame is dishwasher safe and BPA and melamine free. 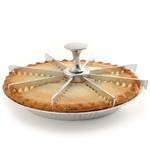 Double sided pie crust cutter makes a professional cut work design on your pie tops. 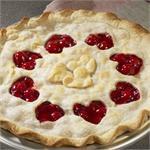 Reversible, 2-in-1 design pie topper makes intricate heart or lattice decorated pie crust. 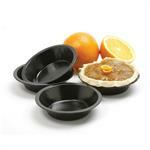 Frame is dishwasher safe and BPA and melamine free. 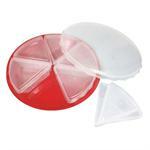 Mark the top of your pie with these pie markers and cut evenly sized slices. A great idea for churches, concessions, bakeries and bake sales. 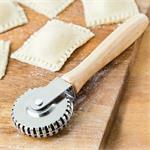 The pastry/pizza roller is one utensil we can't do without. 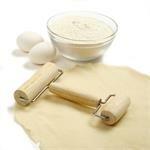 Easily flatten any small amount of dough or pastry; it works great in pans that are too small for a regular rolling pin. The task we use it for most is to level and pack the base for bars. 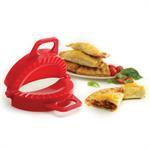 Make your choice of sweet or savory treats with the dough/dumpling press. Use for making dumplings, pasties, turnovers, calzones, piroshkies, pocket sandwiches, empanada's and individual stuffed pies. 6" diameter, recipes and instructions included. 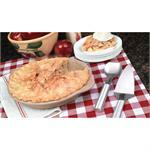 Make individual meat pies, fruit pies, or quiches with this set of four 5" non-stick mini pie pans. Make two - 5" pies with this mini pie baking kit. 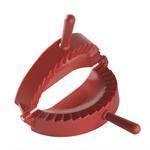 With the reversable 2-in-1 top cutter you can cut a lattice or a pinwheel design in your top crust. Place under pies or other baked goods and this 12" round non-stick sheet will catch drips and keep splatters from making a mess of your oven. The hole in the middle allows heat to flow through for even baking. Gently press top and bottom crust together and trim overhang. Roll the pastry crimper around edge of pie crust for a perfect finished edge. 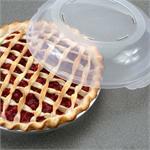 Use the pie saver to keep 8", 9" or 10" pies fresh. You can transport pies to picnics and parties. The 6 smaller containers for individual slices can be used to take slices to work or school or to save the last slice for later. This 6' stainless steel pie weight chain placed randomly in your raw pie shell will reduce shrinkage and air pockets, allowing crust to bake evenly. Includes a handy storage case. Two piece Rada Pie a'la Mode Gift Set includes a serrated pie server, and ice cream scoop in a beautiful gift box. Choice of brushed aluminum (hand wash) or black resin (dishwasher safe) handles. Made in the USA. Cut and serve pie, cake, quiche, cheesecake and other desserts, but be careful - the edges are sharp. Not recommended for non-stick pans. Cut with care in other bakeware. 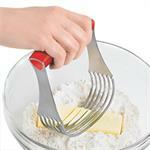 The flexible, stainless steel head gets in and under delicate crusts. 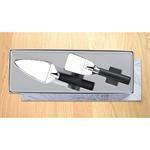 Two piece Rada Serving Utensil Gift Set includes a mini server, and serrated pie server in a beautiful gift box.